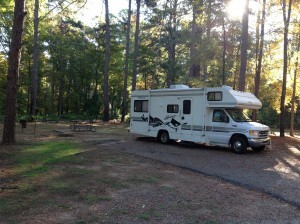 Atlanta State Park is near Atlanta, Texas in the East Texas area. The park had three separate campgrounds. We explored only two of them since it was already dark. The White Oak Ridge camping area had 16 sites, none of which were occupied. They were all back-in and nicely spaced. The area was wooded and you probably couldn’t really view the lake. We ended up in the Knight’s Bluff area, splurging for the sewage sites (2 whole dollars extra). Eight pull-thrus had 50 amp service, the other 6 were back-ins with 30 amp. Plenty of space between sites. I wish they would have let the brush grow for more privacy. There was a picnic table and a fire ring out back. Lots of deadfall for kindling and firewood. But picking it up is prohibited. The park is relatively flat, so the few hiking trails wouldn’t be all that scenic if you prefer mountain trails, but a nice walk though the piney woods. Canoe rentals are available. The sites were only $14 ($16 for sewer) with water and electric. But you have to pay $3 per adult entrance fee. This structure is typical in Texas. No fishing license is needed in State Parks.